An origin of China, Tenda technology has grown and is becoming a popular supplier of internet gadgets. It has various devices which come in handy for home and office use. We can give a few like routers, network switch, power adapter etc. This has given the company a great name as the products are of high quality. 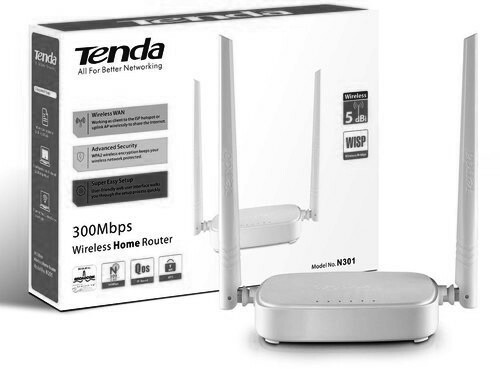 Taking the Tenda N301 which is physical make is a dual Omni Antenna wireless router. The router is basically meant for indoor devices and can connect to all networks. It has four ports for different cables giving chance for both manual and automatic setups. All router work greatly and serve different purpose according to the frequency. However, with the right configuration one will enjoy the privileges offered by the router. Same case with Tenda N301 wireless router, it needs setting up for proper functioning. This though is simple if well followed as you don’t need IT knowledge. You can connect the router without WI-FI using the 1WPS button which connects to WPS gadgets. The best this about the router it is cost-effective and can be used by various devices at home. Before starting the process first power cycle the modem and the router by unplugging them from power. Take the Ethernet cable from your modem and connect it to the router WAN port which is the internet port. After this power the modem then power the router this by connecting power on. Now you can connect and setup the router manually. Open your computer and connect it to the Ethernet ports of the Tenda N301 router. Open your browser and type the IP address and press the enter button. The system will open the configuration page. Check for the internet WAN and now click on the connect type. Key in your ISP information then select the apply changes button. On the same page click on the wireless button and configuration process will be done. You have the option to change the wireless network name and channel. First plug in your router to power and then connect it to the computer. You can use the Ethernet cables which are labeled 1-4. The system will ask for the username and password. For both enter “admin” and a new screen will appear. Select the WLAN setting followed by basic settings and the screen will change. Now select “enable wireless” key in the name of your router on the SSID space and default name as Tenda or any other. Select the apply button and continue to security a new screen will display. Select the security mode and they enter the password required. Select the system tools and change the password though optional.